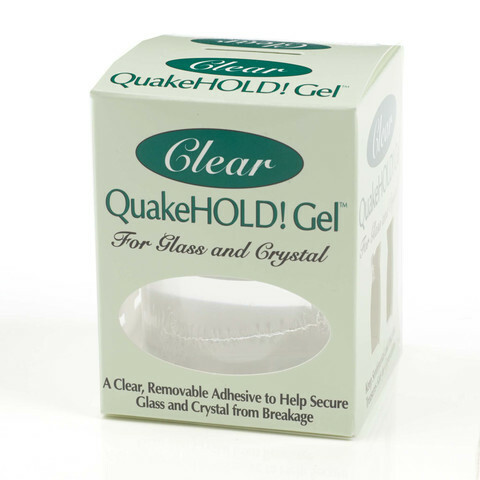 Quakehold Gel is a see-through product that protects glassware and crystal from toppling over and shattering during an earthquake (or if you have kids!). Clear QuakeHold Gel is a see-through product that protects glassware and crystal from toppling over and shattering. It’s the professional collector’s choice. Clear gel is designed primarily for glass-on-glass applications, although it can be used on most surfaces. It is easy to use, just scoop a little out of the jar and roll it into balls. Place on the bottom of an object, press down lightly and twist into position. The gel gradually flows across the base of an item until it creates a superior invisible bond. The gel is designed for use on flat, level surfaces only and takes up to an hour to set properly. A 4oz jar will secure an amazing 300 items! New Zealand is known as the Shakey Isles because of it’s earthquake activity and Wellington sits right on one of New Zealand’s busiest fault lines. QuakeHold products help to keep your loved items safe during a quake. It also helps protect knick-knacks if you have kids running around your home! This product is also available for purchase in store at Wellington Museum and Cable Car Museum. The Hampton Nautical Bosun’s Pipe is one of the oldest and most distinctive pieces of nautical equipment. This beautifully detailed solid brass and copper pipe comes with a quality 39 inch solid brass chain lanyard.